Now for the bad news from the League. Huskies defeated pioneers and rams. They were not successful against golden bears, vandals, the cardinal (the color, not the bird), lakers, and wildcats. 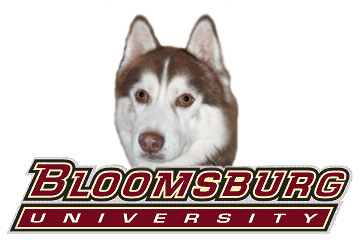 I will point out that the Bloomsburg (Turbo-Colored) Huskies remain undefeated. Ha roo! 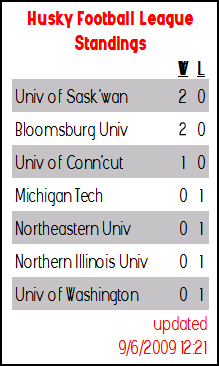 Huskies mostly won their football games this week. They beat 2 varieties of bears: Golden and Regular. They also defeated boiler manufacturers and Troy citizens. 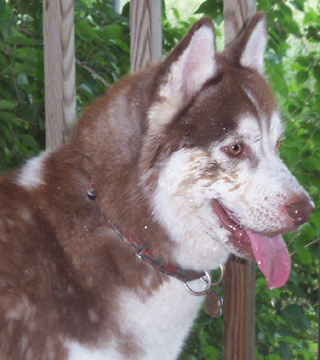 Huskies did not win against wolves and penguins. I understand not beating the wolves, but why didn't Huskies defeat birds who cry ice cube tears????? 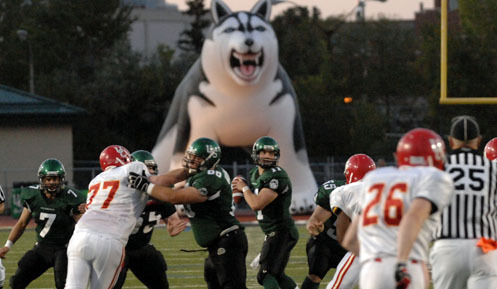 The Saskatchewan Huskies did not win or lose this week because they did not play football. 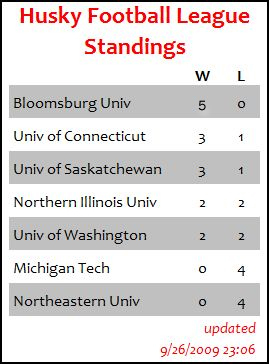 Huskies did not prevail over tarheels, eagles, and black bears. 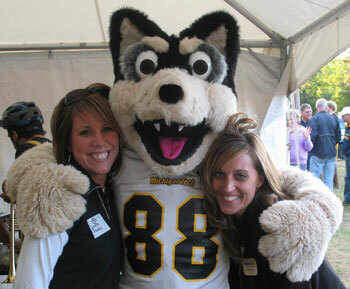 I need to make a special woo out to the Bloomsburg Huskies. They are definitely not stupid. Look at their mascot. I think they will win for this reason alone! 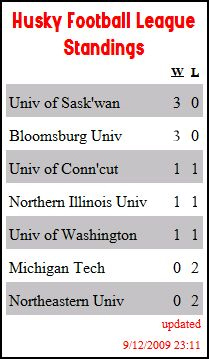 This weekend was (for the most part) the first weekend of my tracking the records of the Husky Football League. 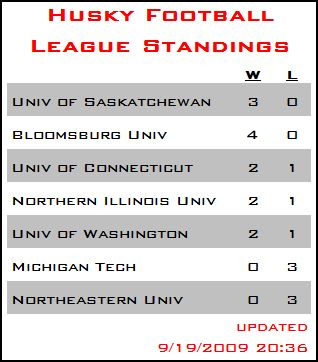 The members of this esteemed league have Huskies for mascots and are universities in the United States and Canada. 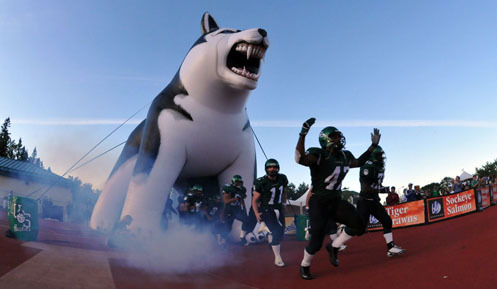 The Huskies heroically beat Dinos, Vulcans, and Rufus the Bobcat. 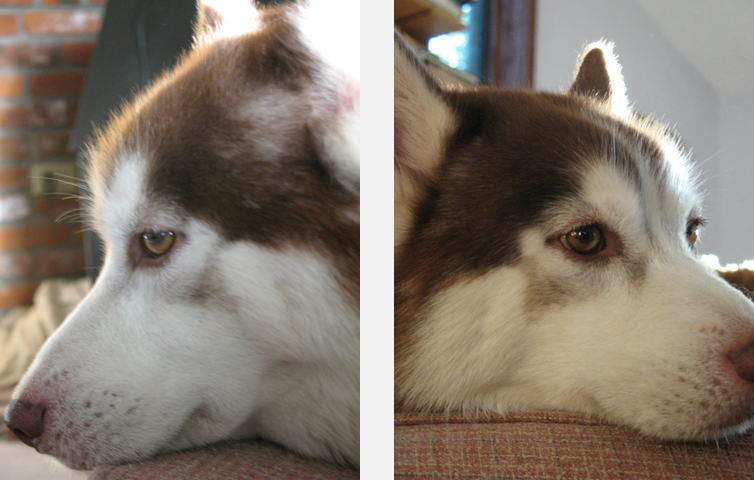 The Huskies valiantly lost to Chargers, Eagles, Badgers, & Tigers.